If you want to find inform­ation in English about bike-friendly train services in France then go to en.voyages-sncf.com and don't go to uk.voyages-sncf.com. You can decide later where to buy your tickets, but to find inform­ation this is the place to go. 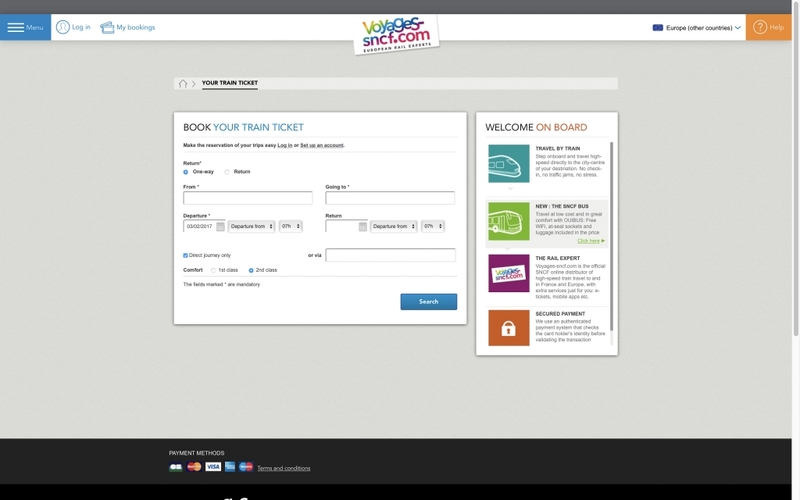 Update: en.voyages-sncf.com also now has a handy facility to restrict your search to bike-friendly trains. 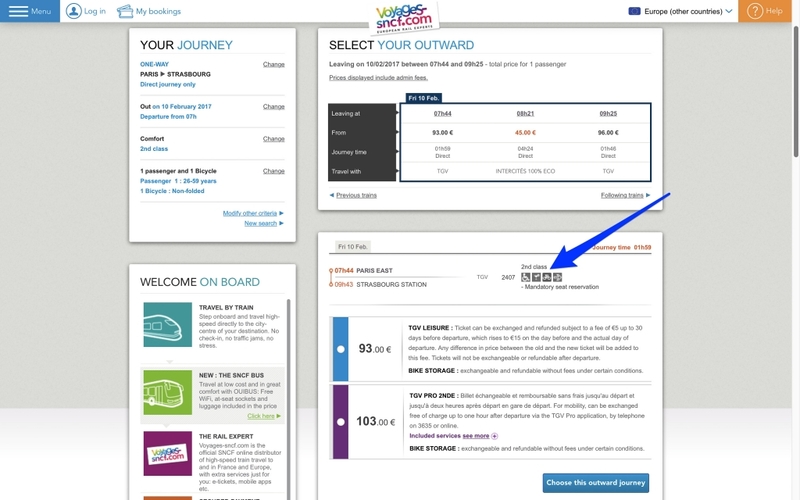 It's available from this page: en.voyages-sncf.com/en/ticket, but it's no obvious where it is —you'll need to read on to find out. You can also now book bike spaces online. If you read that quickly the first paragraph quickly the two addresses probably looked the same, but in fact the French Railways has two English-language versions of its voyages-sncf.com website: one of those includes inform­ation about train services with bike-carriage facil­ities and the other one doesn't. Train companies move in mysteries ways … . 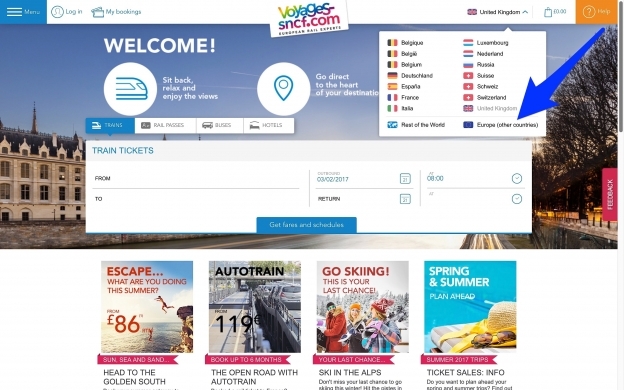 French Railways has has now replaced raileurope.co.uk with uk.voyages-sncf.com but raileurope.com remains as its site for customers in North and Central America. Raileurope.com also doesn't give inform­ation about bike-friendly trains so if you want that inform­ation your best bet is to go to: en.voyages-sncf.com. If you find yourself on the less-useful version then click on the Union Jack and then from the drop-down menu select the 'Europe (other countries)' option. 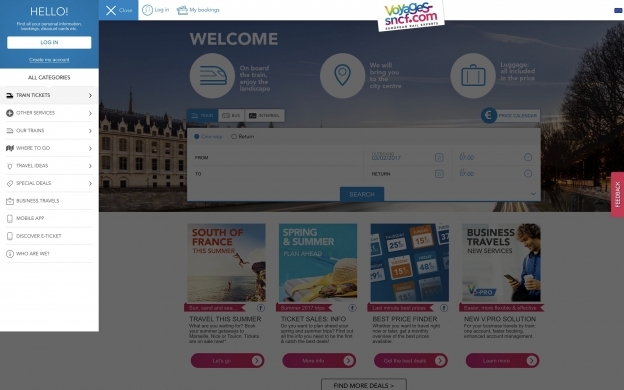 The home page of uk.voyages-sncf.com and the option you need to click to get to the more useful en.voyages-sncf.com. Click to enlarge. Until recently you had to do a timetable search and then check the possible trains to confirm whether or not they carried bikes. This could be a frustrating process. Now you can restrict the search. 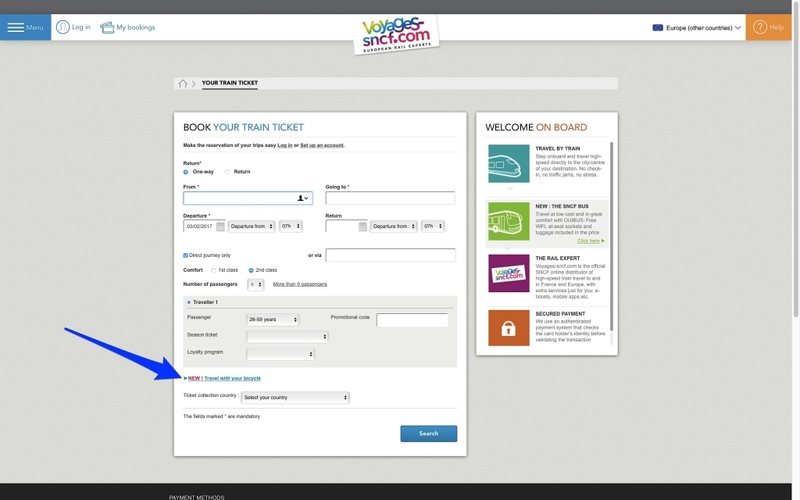 You need to ignore the big timetable search form in the centre of the screen and instead click on the menu button in the top left corner to show a side-panel and from the side panel select 'train tickets'. So far so obvious, but the search option doesn't appear until you click into one of the form fields. Click on the image below and then click through the image gallery as that will make more sense with pictures. 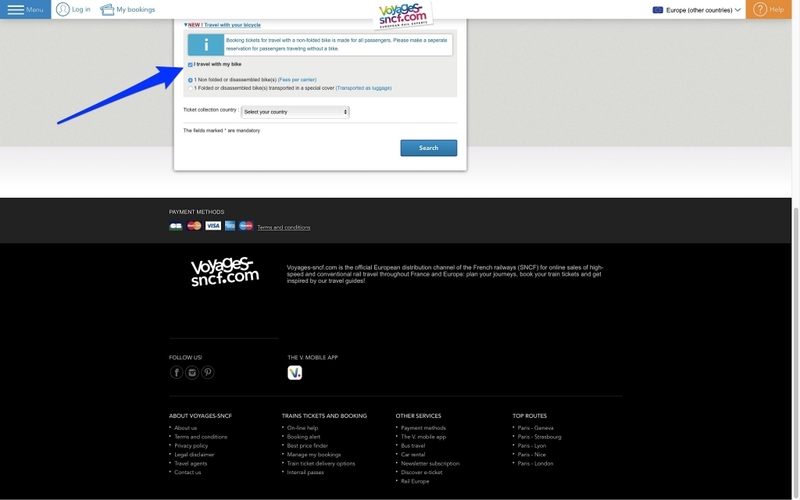 The menu on en.voyages-sncf.com which takes you to the search page with an option to restrict your search to bike-friendly services. Click the image for the next steps. Until relat­ively recently you could buy tickets online but not book and pay for the bike places, which meant that you might as well call the rail company call centre or local agent. But now you can buy the tickets so you might just as well buy online. Important note: that only applies to tickets on French railways and services like the TGV Lyria. 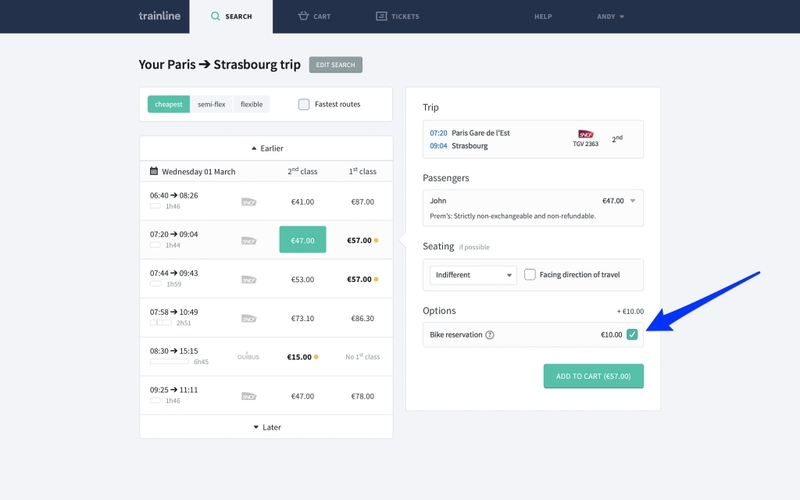 Sadly you can't book bike spaces online for DeutscheBahn trains, so ringing the call centre is still the best bet for onward connec­tions from France. I use trainline.eu. They used to called Capitaine Train — a fresh and funky French start-up who were bought out by the UK company trainline.com. Let's just say that the takeover wasn't greeted with enthu­siasm by Capitaine Train's UK customers, but so far the parent company have had the sense to leave well alone (I hope I'm not tempting fate here). That's it. OK this assumes that you have researched which trains take bikes because if you pick a service that isn't bike-friendly then the box simply won't be there. 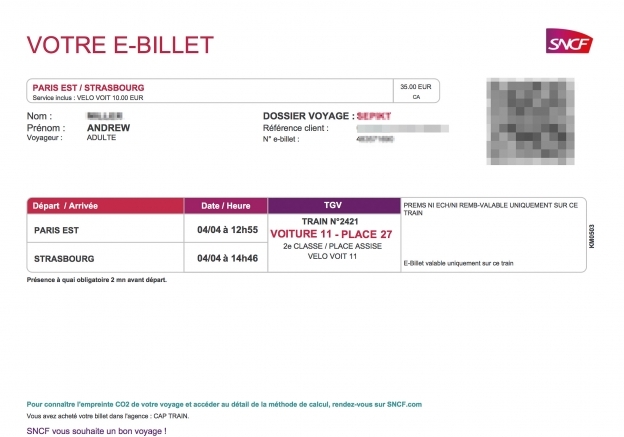 You have the option of getting an e-ticket to print out, or printing it out from a a ticket machine at your departure station in France. But, as I learnt the hard way, if you forget you technically haven't completed the purchase of your ticket and you will have to buy a new one which will almost certainly cost you a lot more. Here's the ticket for my upcoming trip. Now all I have to do is remember to print it out.